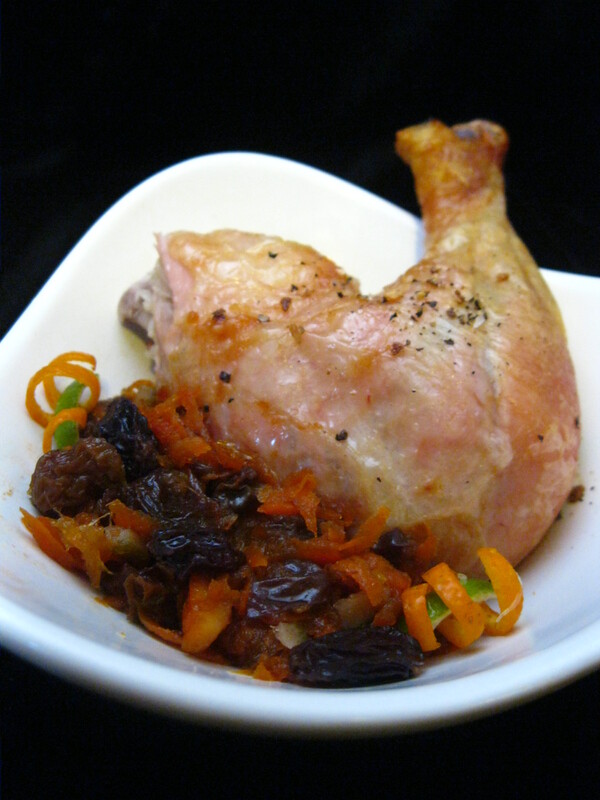 Capon is just subtly different enough from chicken to give this meal a slightly foreign feel. Because of the higher fat content, capon is generally richer and a bit more decadent than your average hen. I poked around for several months for a suitable historical recipe, but came up short. It seems this is one of those recipes that, like Athena, sprang fully formed from GRRM’s head. And since the modern version was so surprisingly yummy, I’ve left it at that. The modern relish has a nice crunchy texture, The citrus is the first taste to hit your tongue, followed by the fast tang of the vinegar, then finishes with the carrots and raisins. The carrots stay crunchy, vying for texture with the tender raisins. When paired with a bite of the capon, the combination is excellent, entirely gobbleable. It’s equally delicious served hot from the oven, or as cold leftovers, as described in the book. Boil carrots in water until tender, around 5 minutes. Drain, saving water and reserving carrots. To 2 cups carrot water, add remaining ingredients, bring to a boil. Reduce heat and simmer, stirring often, 2-2 1/2 hours until thick like jelly. Add the cooked carrots back in and pour into hot jars and seal. If mixture is too thick, add a little water. Nutmeg and/or ginger may be used instead of cloves. Will keep for about a week in the fridge, and is excellent with chicken or capon. « San Diego Comic Con!! Sounds fab. I’ll have to give canning this for long term storage a go . . .
oooh, I like the idea of canning it. It’s not so far off from quite a few modern (meatless) mincemeat recipes either. Chopped and cooked a bit more, mixed with eggs and sugar and baked as little tarts? Which is extra wonderful if you have access to a Persian market and can get the pale yellow dried plums they sell there. My friend has made it with red wine and regular prunes and it was yummy. But I was making it as one of a pair of dishes, for a feast. The other was a deep colored pomegranate sauce so we wanted this to be pale colored and found the Persian plums (which the lady at the store said THEY use for a chicken stew!) and a white Moscato for the wine. We used Cava Cava (red navel) oranges for the feast, though had tested it with blood oranges when they were in season during our planning stage. We considered golden raisins, but then decided currants in the pale sauce were well enough. The pomegranate sauce was Italian. Take pomegranate juice and cook with cinnamon until thick and beginning to brown. Hmmm, we took pomegranate molasses and lightened it up with fresh pom juice. There may have also been sugar, and vinegar. I don’t quite recall as we made it well in advance and canned it in mason jars. But the capon in sauce we made fresh. Wil any type of vinegar work? If not, what’s your preference? Red wine vinegar is usually a safe bet. If you have a particular favorite, feel free to innovate! too me this sound like Tzimmes (http://en.wikipedia.org/wiki/Tzimmes) a traditional Jewish dish that has been traced back to the early middle ages. Yes! My grandmother makes tzimmes! Her’s is less zesty than this recipe, but great shout! I’m not clear about the carrots. After you boil them and drain, do you put them back into the 2 cups of water along with the remaining ingredients? or do you throw them out and just use the carrot water? or do you add them later? In the picture I’m seeing what looks like bits of carrot but I’m thinking that after simmering them for 2.5 hours they are going to be mush. By the way, I’ve made several of the recipes from your book and everybody LOVED them. Good catch! You keep both water and carrots, the latter of which you add back in after the epic simmer. I made this yesterday afternoon and my house smelled wonderful! It is absolutely delicious. It would be very good with pork too. I froze the extra in 8 oz containers. Altogether I got five of these containers from the recipe. I used the original spices, cider vinegar and currants instead of raisins because that’s what I had in the cupboard. I think next time I might try a different mixture of spices including star anise which I love but never seem to find anything to use it with. How many jars can this particular serving fill up? I’m planning to make more of this relish since many people in our place have been used to being served with a papaya relish (which we call achara), and I’m sure they will love this one as well. Great idea. It looked amazing in the photo, smelled good for about the first 45 minutes, but after being simmered over a low flame for a little over 2 hours, it was NOT excellent, crunchy, or delicious. It tasted like carrots and raisins in sticky bitter sugar syrup. When I think of a “relish”, I think of something distinctively sweet, sour, crunchy, and fresh-tasting, something acidic enough to cut through rich, heavy food. Problem #1: Calling for peel instead of zest. I’ve made several kinds of marmalade before. The pith on citrus skin contains compounds that leach out and make food inedibly bitter, which is why you trim off the pith for marmalade. If you want to keep the pith, such as in candied orange peel, all the recipes that I have used with success call for boiling or soaking the citrus skin in 2 or 3 changes of water, and discarding that bitter soaking water. I used a vegetable peeler to carefully skin all my citrus for a more zest-like product, but given that the recipe definitely called for “peel”, I shrugged and didn’t go any extra lengths to trim off the small amount of pith that still clung to under a cup of citrus skin. This was a huge mistake as it embittered the entire batch. Problem #2: Two to two and half hours. Why so long? No justification is offered for such an extended cooking time. Even getting a typical jam or jelly to the set point takes no more than 30-45 minutes, it *can* take longer in large volumes, but 2.5 hrs? Was the intent to thicken via pectin, reduce via evaporation, or what? If pectin, give a target temperature. If evaporation, give a target volume. I tasted this about every 15 minutes as it simmered, and I’m sorry now that I didn’t go with my instincts and take it off the burner much sooner. It tasted like a great balance of sweet-sour-spiced at 45 minutes, but was completely runny. At two hours, the bitterness had popped, the aromatic qualities of the spices had almost entirely cooked off, and any sense of a fresh relish-y taste was dead and gone. Problem #3: The (1 cup sugar). I’m not certain of the intent of the parentheses. Is it optional? Should it actually have been subtracted? 3 cups of various sugars seemed reasonable. The sweetness was too sweet against the 1 cup of vinegar (% acid would be helpful, I used a low acid red wine vinegar), yet not enough to counter the bitterness. Minor, but confusing. Problem #4: This makes one quart, not two cups. This was the first thing I’ve made from this site, it really was quite a disappointment. I like the ideas, the photography, but not the lack of testing on the actual thing that I would end up eating. I’d like to make this again, and I probably will, because I am sufficiently annoyed. Fundamentally, this cannot be treated as a “relish” or “chutney” if you want to include “bits of orange and lime” peel, the ingredients are incompatible with the technique. Option 1: Use good quality candied peel, or homemade, and re-balance the sugar/vinegar ratio. Maybe include sure-jell or pomona’s to add pectin. Option 2: Reinterpret the text. Use “bits of orange FLESH and lime FLESH”, separated entirely from the membranes, plus a smattering of zest, very carefully make sure no pith is included. Add the zest at the end, not the beginning. Again, might require additional pectin if a marmalade/jelly-like quality is wanted. Option 3: Use the boil-and-drain method on the citrus peel, keeping the pith. Repeat as necessary, tasting as you go. Either way, I would cut the cooking time drastically. I would add the spices at the end of cooking instead of the beginning, as well as reserving some fresh minced zest to stir in at the end for that aromatic bounce. If I were using a particularly flavorful honey, I would stir that in at the end, but I didn’t feel like it served any discernible purpose (other than a sort of standing tradition to put honey in all the things?). I certainly did not taste any honeyed quality. Would also reserve the juice from the limes to use for re-balancing sweet-sour after the relish has cooled slightly. Would also just throw the raw carrots in for 5 minutes to simmer at the end, instead of going through the laborious carrot water extraction. The flavors will meld as it sits post-simmering, it’s not necessary to boil something as strong as citrus peel in something as faint as carrot water. I will post details if I re-make this. Still think it is a neat idea, just needs work to be reliable and reproducible. Sorry you had such a lousy time with this recipe! I wrote down everything that I did when I made it, and it worked beautifully then. However, if it doesn’t work for everyone, then it clearly needs a little more tweaking. The times and rough proportions were from the recipe (now misplaced) from which I originally worked. Most of our recipes are thoroughly tested multiple times, but this one fell in the midst of cookbook deadlines, and a few things clearly slipped through the cracks as we were trying to both update the blog and meet our deadlines.